Sold in a box of 2 x Pre-packed cannisters specifically for the range Poseidon Rebreathers. SofnoDive® is the Molecular Products brand name for its soda lime formulations of carbon dioxide absorbent, optimized for the removal of carbon dioxide from recirculated breathing gas systems. 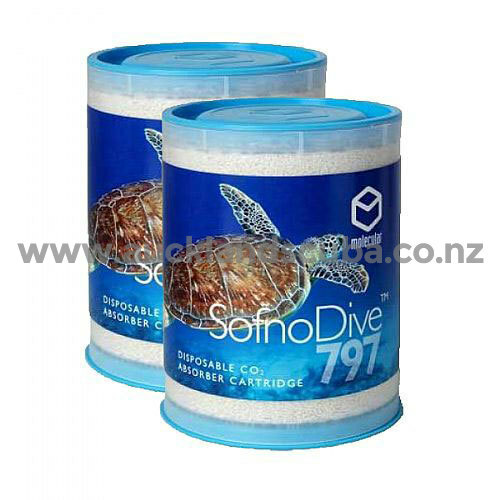 SofnoDive is a carefully prepared, low dust, mixture of calcium hydroxide (>75%) and sodium hydroxide (3%) with a precise amount of water moisture and binding agents. SofnoDive containers maintain proper absorption capacity for five years.